Recently, Jhatkaa had organised a meeting on the city's air pollution. Bengaluru: This group of 12 volunteers do not believe in status quo and definitely not about things they feel passionately for. They are the brain behind jhatkaa.org, an online platform which aims to bring the government's attention to issues that matter and ail the common man. It is done with the help of society and by engaging citizens to hold corporate, cultural and government leaders accountable in real time at key decision moments through various digital communication platforms. 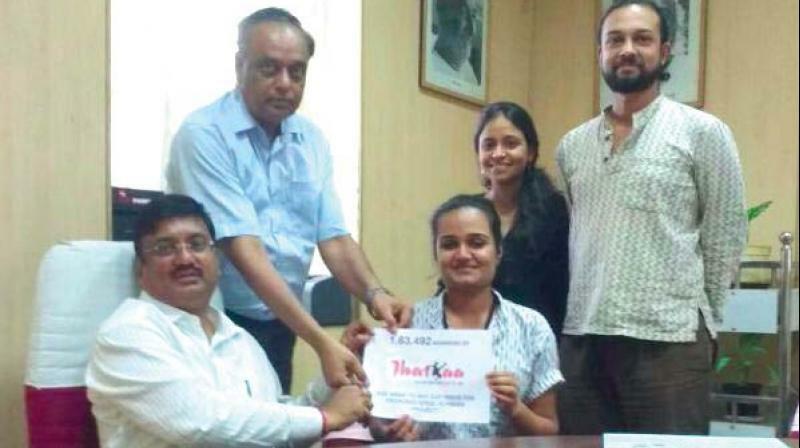 The group was involved in the launch of the mobile campaign for the Steel Flyover Beda movement, which connected 1.6 lakh people. "It is not just urban apathy and civic issues, we also focus on women's rights and LGBT issues. Currently, we are concentrating on air pollution and pushing authorities to work harder," said Noah D’Mello, senior campaigner, Jhatkaa.org. He said that their movement against open garbage burning also gathered big support from the public and BBMP. “For the campaign, we had asked people to send pictures from their areas. One part of the campaign is citizen submissions of photographs of open burning of garage and dry leaves in their neighbourhoods through a Whatsapp forward-based system. Jhatkaa collated information into an interactive map which showed the affected spots, so one can see how widespread the problem is and which parts of the city are severely affected," he said. Their digital campaigns now have a constant support of close to 1.8 lakh people from across the country, who sign petitions, participate in various campaigns and actively involve themselves in the digital uproar. Recently, Jhatkaa had organised a meeting on the city's air pollution. “We have installed air quality monitors, which keep track of PM2.5 and PM10, in Koramangala 6th Block and ST Bed Layout. On an average winter day, the morning hours of 6 to 8 are the most polluted. On certain days, PM2.5 levels were as high as 145, which is more than twice the normal level (60). This is the time when vulnerable groups like children go to schools and senior citizens go for morning walks,” he explained. Over 4,000 people, living, working or studying in Koramangala, have been receiving daily PM2.5 and PM10 updates via SMS, in addition to health advisories and dos and don’ts during poor air quality days. “There is no denying that winters are the worst time of the year in terms of air quality. We need a pollution litigation mode, otherwise soon we will see ourselves battling what Delhi is facing. Yes, the extent of air pollution is not as severe as Delhi’s, but it is still in the moderate to poor zone. We should not be content with the fact that we’re not as bad as Delhi. We need to make sure our beautiful garden city does not reach a point of no return," he stressed. The team currently wants the Karnataka State Pollution Control Board (KSPCB) to install more continuous ambient air quality monitoring stations, based on the recommendations of the central board. An expanding metropolitan city like Bengaluru requires 41 monitoring stations, but now there are only 17, and 5 more have been reportedly purchased by the KSPCB. But the latest air quality data on the KSPCB website is that of October 2017. “What is the point of providing data that is not real-time, or worse, two months old? Even if the old data could bring about a change in policies, then maybe we could say it’s worth it. But vehicular pollution is not tackled and as seen by air quality monitors, the air quality is not improving. There are insufficient measures in place to tackle this. It’s time the government comes up with a plan," explained Divya Narayanan, campaigns manager, Jhatkaa.org. The team has started another online platform which concentrates only on air pollution called Air A!ert that allows people to start, run and deliver their own campaigns on anything related to air pollution.